QMotion Advanced Shading Systems, a rising star in the home technology channel, has been by acquired Legrand North America, parent company of NuVo, On-Q, Pass & Seymour, Vantage, Watt Stopper, Middle Atlantic and other leading brands in the home automation, lighting controls and building infrastructure categories. Legrand will bring a “much broader and deeper global reach for QMotion,” says Cassie Metzger, senior brand development manager for QMotion in an interview with CE Pro. That’s on top of the progress QMotion has already made in the custom electronics market in its few short years in the motorized shading business. QMotion was founded in 2010 by Willis Mullet, former CEO of Wayne Dalton Corp., a leading manufacturer of garage door openers. The company began selling motorized window treatments through the custom electronics industry shortly thereafter, and by the 2015 the company claimed 27% of the CE Pro 100 integrators as customers. QMotion ranked #3 in the motorized shade category among CE Pro 100 companies in 2015, behind Lutron (74%) and Crestron (30%). 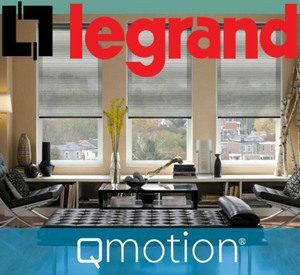 Legrand is a giant in home and building controls, with international reach and an established base of customers including home systems integrators, electrical contractors and commercial integrators – a welcome audience for QMotion.